‘Hope’ travels west from Virginia | Ag Moos "Growing the Land"
*** Hope is sometimes a fragile thing, yet it can be as durable as the land and the people who are sustained by it. Heifers for South Dakota has a beautiful facebook page where stories of hope are told. Their latest post is about the recent delivery of the last of the heifers featured in the story below. One by one, people — and heifers — are making a difference. HARRISONBURG, Va. — Ever lay in bed at night and get hit with an idea? That’s what happened to Virginia cattleman Lynn Koontz of Spring Valley Farms, Harrisonburg, after hearing and reading about South Dakota ranchers devastated by Storm Atlas last October. He recalled how years ago, he and his dad had dry years, “and those boys out West would load hay on rail cars and ship it East,” said Koontz, wanting to return the favor. So Koontz, who serves as president of Rockingham Feeder Cattle Association, talked to Ty Linger, founder of the Montana-based Heifers for South Dakota project. The window of opportunity was short because spring calving gets underway in both regions this month. In late December, Koontz put the word out to fellow cattlemen that he was organizing a western cattle drive of sorts. He and his children donated some of their own bred heifers and asked others to do the same. 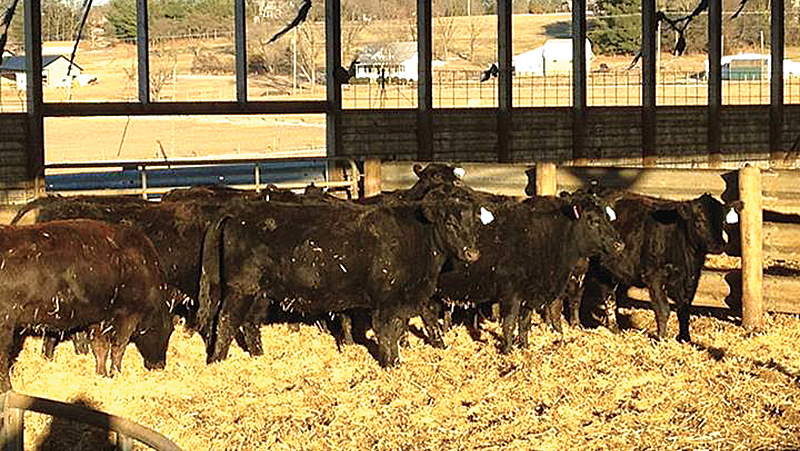 Koontz received donations of 40 bred heifers and cash from more than a dozen cattlemen in Rockingham and Augusta counties, and local businesses gave toward transportation costs. The 40 heifers have been commingled by Koontz at his farm near Rockingham County Fairgrounds. They were preg-checked last week and readied for transport. At dawn on Thursday, Feb. 6, they’ll board a truck at Rockingham Livestock on the first leg of their journey with a stopover at Greenville Livestock near Hugo, Illinois on the way to South Dakota. That stopover will break the trip into two 12- to 14-hour rides. Lifelong friends Clem and Doris Huber of Illinois — with whom Koontz stayed as a kid in the 4-H exchange program — helped him locate the place to yard the cattle just off the Interstate in Illinois. To-date, Heifers for South Dakota reports delivery of 714 head of cattle to 68 ranchers with 176 head of pledged cattle still yarded. They have also received about $265,000 in monetary donations to help with transportation costs and to purchase quality bred heifers for donation. “Value of cattle delivered into the hands of those who are hurting is in excess of $1.25 million,” according to the project’s Facebook page. While this is a drop in the bucket — in real economic terms — the hope these donations bring has been absolutely huge. For Koontz, it’s not the cattle losses he is focused on. It is the loss of young ranchers he is hoping to help prevent. Some of those young families lost it all in October just before they would have sold that calf crop, plus they lost the cows to have another calf crop this season. That’s potentially two years without income because the fall sale of the calf crop is the income for the whole next year. Koontz and his wife Kim operate their cow-calf and cattle backgrounding operation, along with two broiler houses and crops. The participation in Heifers for South Dakota has been a family affair with son Bud and daughters Lacey, Katlyn, Jessica, Cindy and Vanessa all pitching in. Koontz is working with cattlemen in other parts of the state to do a later round of open heifers for donation this summer. To learn more about Heifers for South Dakota, visit their website at http://helpforsouthdakota.com and “like” the “Heifers for S. Dakota” page on Facebook to see how ranchers are helping across the country. This entry was posted in Uncategorized and tagged agriculture, Beef, bred heifers, Heifers for South Dakota, hope, ranchers, Rockingham Feeder Cattle Association, South Dakota, Spring Valley Farms, Storm Atlas, the blizzard that never was, Virginia by Agmoos. Bookmark the permalink.